About the book. On 14 August 1937, during the Second Sino-Japanese War, Shanghai’s history took a dark turn. As a typhoon approached the city’s horizons, so did bomber planes, and as citizens went about their daily routines, Shanghai experienced a terrible civilian aerial attack. On that bloody Saturday, many lives were lost. Paul French, an author much-praised for a meticulous approach to narrative non-fiction, does not shrink from the horror of lives torn apart; he draws on eyewitness accounts of those that survived to reconstruct incidents such as the violent attacks outside the infamous Cathay Hotel, close by the Bund, and around the Great World amusement centre in the French Concession. About the author. London-based Paul French lived and worked in Shanghai for many years. He is a widely published analyst and commentator on China and has written a number of books, including a history of foreign correspondents in China. His book Midnight in Peking was a New York Times bestseller, and a BBC Radio 4 Book of the Week. It will soon be made into a mini-series by Kudos Film and Television, a UK based production company. Paul is currently working on City of Devils: A Shanghai Noir, which is explores the dance halls, casinos and cabarets of wartime Shanghai, it is set to be published by Penguin China in November. 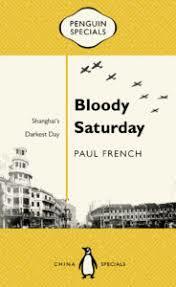 Details: Bloody Saturday is published by Penguin Books China. Available in paperback throughout APAC from 7 August, the eBook is also available worldwide. Priced in local currencies.